They say you are as young as you feel, right? of course, I've felt 29 for a few years now! But what age does your skin feel? Funny how your reflection in the mirror isn't on the same program! Unfortunately, age, gravity, stress, environment...they affect us all, in particular, our skin. If you are like me, trying to bridge the gap between your "true" self and that stranger in the mirror, you are intrigued by the advances in skin care and anti-aging regimes. a full line of botanical, science infused skin products to help you pamper yourself and reduce the gap! 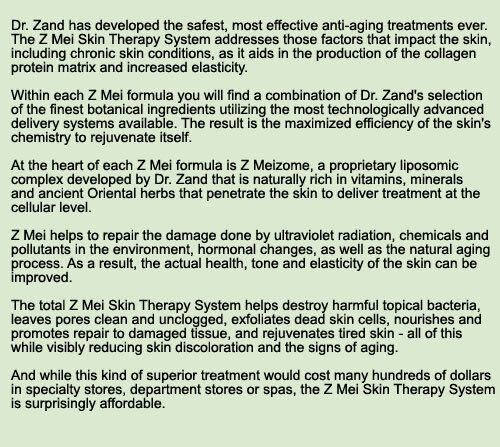 Dr. Zand's experience in healthy skin care is tremendous. Author ~ Smart Medicine for Healthier Living, Smart Medicine for Healthier Child, and A Parent's Guide to Medical Emergencies. In a culmination of her extensive experience and knowledge, the Z Mei Therapy System offers women an opportunity to fight back against the gap with the best science and nature have to offer, at fabulous prices! Z Mei products, infused with antioxidants and botanical ingredients, closes the gap by helping to restore your skin your skin's natural balance to that of your more youthful chemistry. At That's What She Said, we are all about finding new ways to pamper ourselves with the best products, but with savings to enable us to keep shopping! Z Mei's luxurious line allows just that! Or choose any eight items for only $20 more! 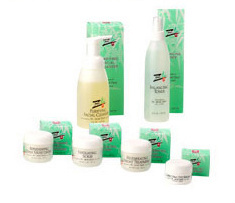 I was given an opportunity to test the Z Mei line with a 10 Piece Set, which includes all items shown above in the Six Piece Set, as well as Nourishing and Revitalizing Shampoo, Hair Repair & Strengthening Conditioner, Retoning Hand & Body Moisture Therapy and Intensive Repair Therapy For Hands! I can tell you, first hand, that the Z MEIZONE in Z Mei products delivers! As with all high quality products, the Z Mei products are quite effective, without having to apply significant amounts, extending the usability of your products and making Z Mei quite affordable. I found that all of the products tested worked as described, much to my pleasure. In particular, I did quite enjoy the benefits of the Z Mei hair care products, leaving my hair healthy and shiny, without the weighted down feel one gets from the use of lesser quality products. The Exfoliating Scrub left my skin smooth, toned and glowing and me feeling pampered and refreshed! Further, the botanically based scents of the various Z Mei products were enchanting! From the citrus of the Purifying Facial Cleanser, to the minty undertones of the Retoning Hand & Body Moisture Therapy, I was able to pamper myself in a spa-quality fashion! Z Mei is generously offering That's What She Said readers a chance to win a Six Piece Complete Skin Beauty System for themselves, valued at $79.99! To be eligible to enter this giveaway, you must follow That's What She Said via Google Friend Connect (mid right sidebar). This giveaway is open to residents of the US & Canada, 18+ and will end on Saturday, June 18, 2011 at midnight, EST. The winner will be randomly selected from all eligible entries. The winner will be notified by email and will have 72 hours to respond before I must move on to a runner up. Please leave your email address in your entry comment, in anti spam format, if it is not available via your comment name, so I may contact you if you are the winner. For mandatory entry, please visit the Z Mei website and then come back here and tell me in a comment which product you'd love to try and why. IF YOU ARE ALREADY FOLLOWING, SUBSCRIBING AND THE LIKE, PLEASE TAKE THE ENTRIES! * Like That's What She Said on Facebook, leave a comment here with your Facebook name, 2 entries. * Tweet about this contest. Limit of 3 tweets per day. Leave comment with your Twitter name for 1 entry per tweet. * Share this giveaway with a direct link back here in some other fashion: Blog, Stumble, Digg, FB, post to giveaway linky - anything goes. Leave a comment here with a link to your sharing. 2 entries per sharing! Handy share button at bottom of the post. * Enter any of my other active giveaways, leave comment here letting me know which, 2 entries per additional giveaway. * Enter my Cymax Scavenger Hunt giveaway, for a chance to win ONE of TWO $50 gift certificates to any of the 100 Cymax Online Stores, leave a comment here with applicable name for 10 bonus entries. * Subscribe to That's What She Said via email or RSS feed (mid right sidebar). Leave a comment with your applicable name, 1 entry per method. * Follow That's What She Said (tsue1136) on Stumble, leave a comment here with your Stumble name, 1 entry. Congrats to turq, comment #231, courtesy of Random.org! ON BEHALF OF Z MEI SKIN CARE AND THAT'S WHAT SHE SAID, THANK YOU TO ALL ENTRANTS FOR PARTICIPATING AND FOLLOWING! 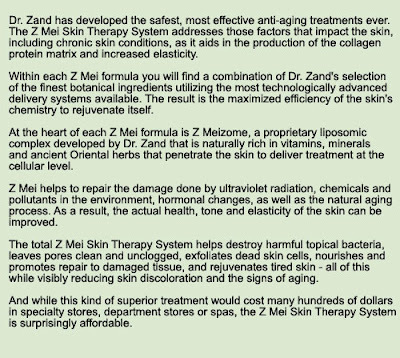 I was provided with a Z Mei Skin Care System to explore for the purposes of creating this review. Z Mei is sponsoring the giveaway prize and is responsible for shipping prize to winner. Images and information taken from various Z Mei sites. The opinions above are both honest and my own. Facebook is in no way associated or responsible for this feature or giveaway. I would like to try the balancing toner because the exclusive Z Meizome helps provide anti-bacterial, anti-inflammatory, and antiseptic benefits to calm surface disturbances, while locking in moisture, helping to keep skin smooth, soft and supple. I really feel like my own age, which is 28. I would like to try Corrective Eye Serum, because I think I could benefit from it the most, as that area of my face needs the most help. Forgot to mention that I follow you on GFC as Elena. I also Like you on Facebook as Elena Amble. I most definitely feel younger than my age. The task is to get the world to agree. Subscribe to your RSS feed in Google Reader. I follow your blog publicly with google friend connect and I'd love to try the Purifying Facial Cleanser! I feel like I'm only 18! I follow on GFC as bukaeyes and I'd like to try the retoning Hand and Body Moisture Therapy because I suffer from really bad dry skin sometimes! I'm 33 but I feel a bit older. I've been trying my best to change this! 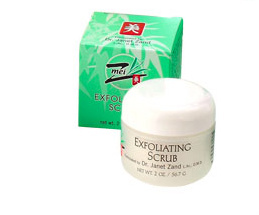 I follow your blog publicly with google friend connect and I would to try the exfoliating Scrub because my face is oily & has large pores which needs a deep cleaning to remove the pore clogging impurities and toxins... and this will do that. Well... I feel a younger then I look, you can for sure see my age, I wish to gosh it didn't show but the truth is I do have more then my share of fine lines and wrinkles. I don't have a favorite beauty routine, it's about time I did, if I win this I can one started. Might be a little late in life to start one now, but better late then never. I need this and would love to win it. shared on google not sure if I did it right.. went to my book marks.. so I'll enter it once and your welcome to check and delete if I did something wrong. I follow on GFC (elysesw) and would love the correcting eye serum. My bags and circles tell the reason why. I'm following via GFC and I'd love to try the Regenerating Night Treatment because my face is really dry and I'd love to sleep while it works it's magic! I'm 23 years old but I swear I still feel like I'm 17. I gave this post a thumbs up on StumbleUpon! I submitted the link to this post on Digg! I added this link to a linky! I'd love to try the Hair Repair and Strengthening Conditioner because my hair is really thin and fine and I'd love to see if this helps stop all the breakage. I am a new GFC follower (Cataroo) and the product I would most like to try is the Correcting Eye Serum! My eyes are a HUGE problem for me right now! I will be turning the BIG 5-0 in less than a month -- but in my heart I still feel like I am in my early thirties! LOL! I am a new e-mail subscriber! i would like to try the retoning Hand and Body Moisture Therapy because my skin is so dry and itchy and nothings seems to help.. it really needs a "makeover"
I would love to try the Correcting Eye Serum. "The nutrient-rich formula works all night to deeply penetrate the delicate eye tissue and help normalize and correct the skin's lipid chemistry, increasing elasticity and reducing the appearance of fine lines and wrinkles. You will see dramatic results right away and even greater improvement over time as you continue to use the serum."